100% brand new,high quality wood material. The numeric cubes could adust any date in calendar, but each only have 6 digits in. 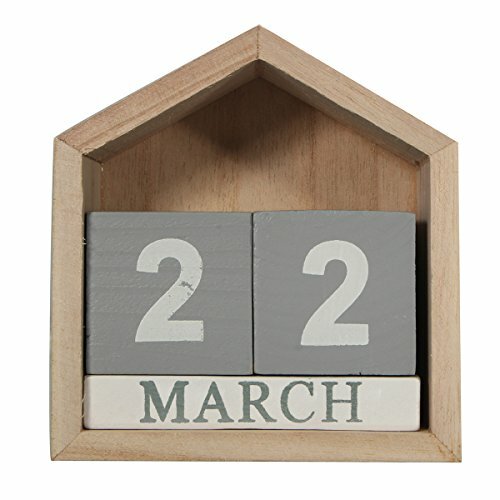 You can rotate the blocks and months and never need to replace your calendar again. As there are no years printed, this calendar can be used year upon year. Can do creative wood calendar, desktop Decoration, shooting props, shop decoration and so on. ✔ Material: Made of Wood, hand-painting, stylish and durable. ✔ Features: With two large number blocks and a month block. Small wood pieces represent 12 month and 2pcs dices represent date. ✔ Reusable: Without no years printed, this calendar can as a classic gift which will will reusable for year after year, used for a very long lasting time. ✔ Fashion Decor: Stylish and practical, this wooden perpetual style calendar add a touch of style to your home, office, store and etc.